Above: 1. 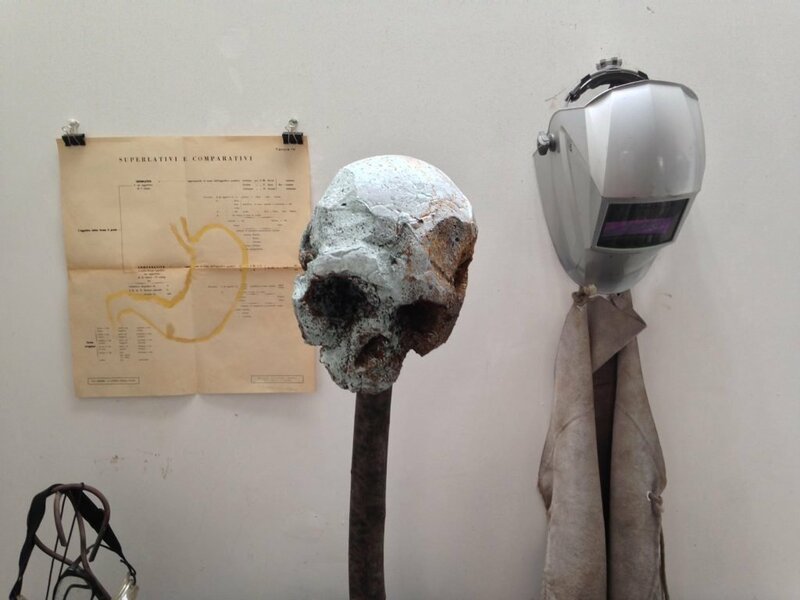 Davide’s skull sculpture which I first saw at the A.I. 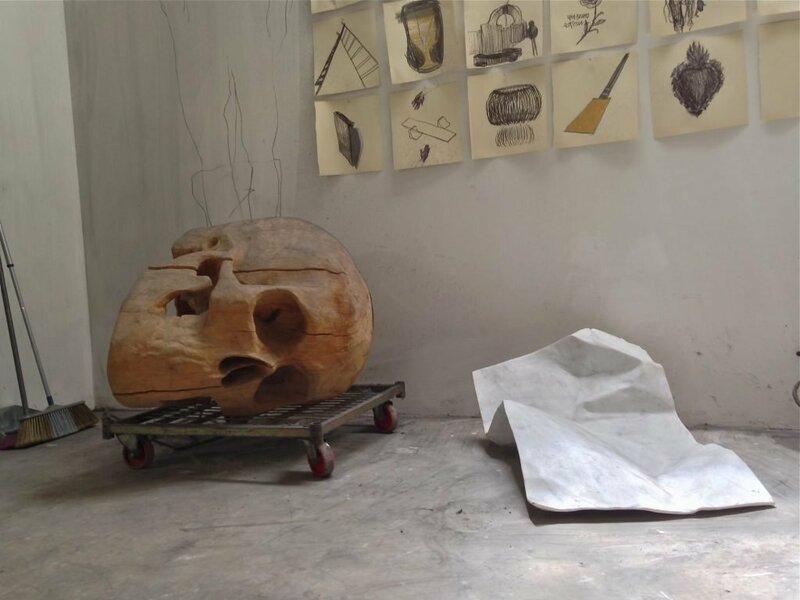 exhibit at AltaRoma last summer & a marble sculpture. 2. Work in progress. 3. Piece that Davide created for Diego Buongiorno’s performance of “The Bush.” 4. Alessandro di Cola, designer of ShootinBags1981, hard at work 5. 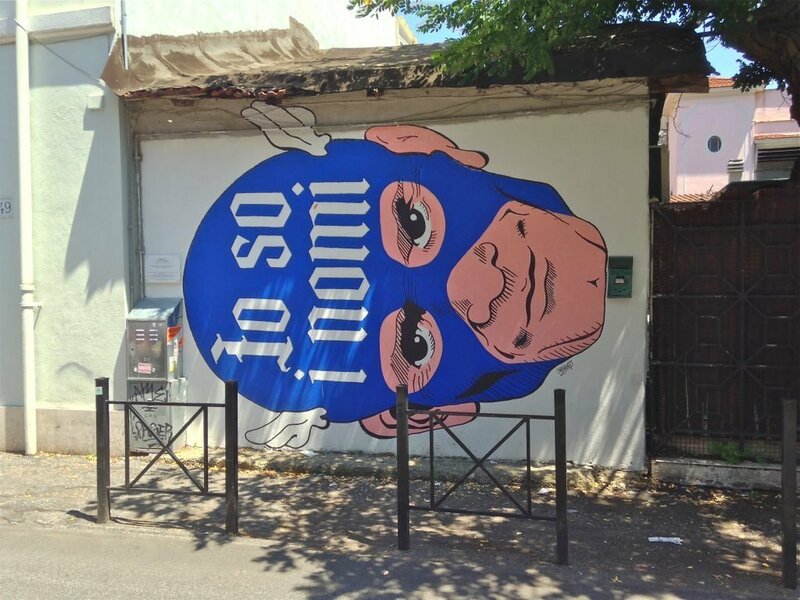 Part of the street art installation dedicated to Pier Paolo Pasolini 6. More art from the street show: Murals by Maupal of Pasolini’s eye and a tribute to Pasolini’s The Gospel According to ST. Matthew. 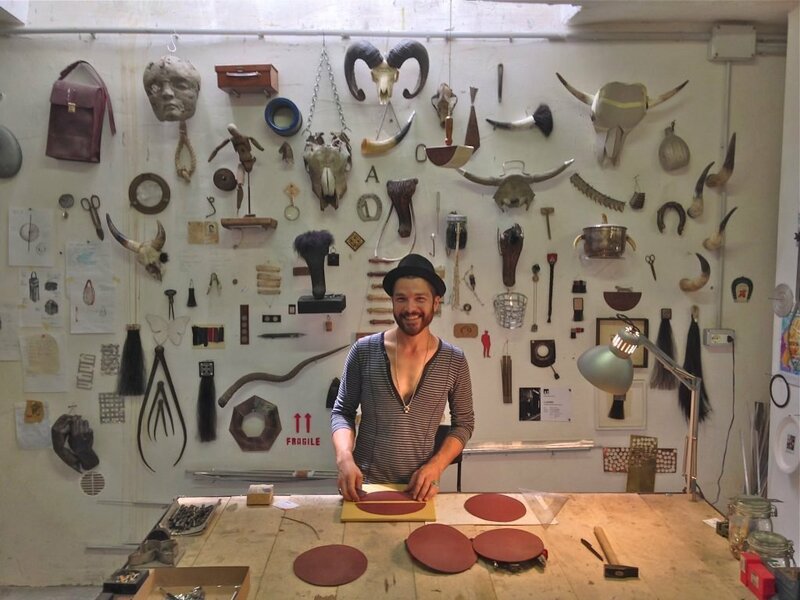 While I was in Rome last month, I had a delightful visit at the studio of my friend Davide Dormino. A well-known artist who works in various media, particularly outsized sculptures, Davide lives and works in Pigneto, which is more or less a suburb on the outskirts of Rome. Pigneto is famous for being the bohemian neighborhood where Pier Paolo Pasolini hung out (most famously at the café Necci) and where he shot his first film, Accattone in 1961. Davide explaining his latest project to me–which I think I might be involved in? I was photographed for it at the A.I. exhibit. This piece by Davide is about Pasolini’s last day. On November 2, 1975, Pasolini dined with his friend Giuseppe Pelosi, a 17-year-old male prostitute, at the famous Roman café Il Biondo Tevere. After dinner, they went to the beach at Ostia where Pasolini was murdered. Originally, Pelosi confessed to the murder but he retracted that 29 years later. Rumors abound about his death, and one of the theories is that Pasolini was murdered for political reasons, because he was a Communist. When Davide conceived this piece, he went to Il Biondo Tevere to see if he could buy two of the chairs that were used in the restaurant in 1975. To his dismay, the café had changed their decor and the old chairs had been replaced. But then the proprietor took him down into the basement and the old chairs were in storage. He gave two to Davide? Are they the exact two chairs that Pasolini and Pelosi sat in on that fateful day? I think so! This is a work in progress that hasn’t been shown yet. Seven archetypes (your mother, father, teacher, lover) rendered in aluminum that will be hung on the wall like hunting trophies. 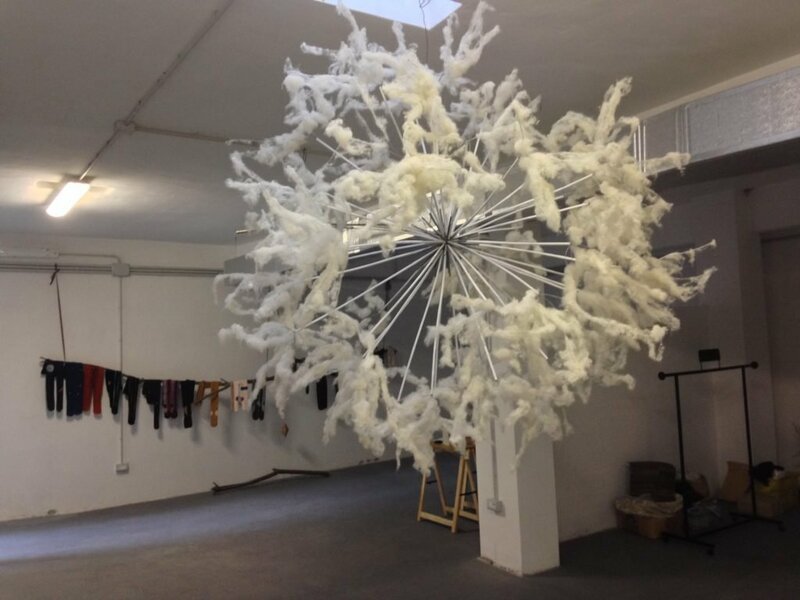 An installation that is an homage to Alexander McQueen. I really love these giant spikes! I met Sacha Turchi, who is one of Davide’s art students. She showed me her sculpture “Placito” which replicates dorsal spines with microphone attached. Viewers can interact with the sculpture and create various sounds by touching it. It’s a statement about healing. ShootingBags1981 designer Alessandro Di Cola, who I featured in my report on the recent A.I. exhibit at AltaRoma, shares the studio with Davide. Here’s one of his Mongolian lamb fur bags. Alessandro models one of his horsehair creations. Chic! More ShootingBags1981 in the workshop. I had a wonderful brunch with Davide and Alessandro at a place near their studio, and then we made the obligatory visit to Paolini’s old watering hole, Necci, for some coffee. Portraits of the great director are hung all over the café. I took this photo of this Pasolini portrait during my first visit to Necci, back in 2009. I’m not sure if it’s still there. Necci’s bathroom back in 2009. I love some of the street art in Pigneto. 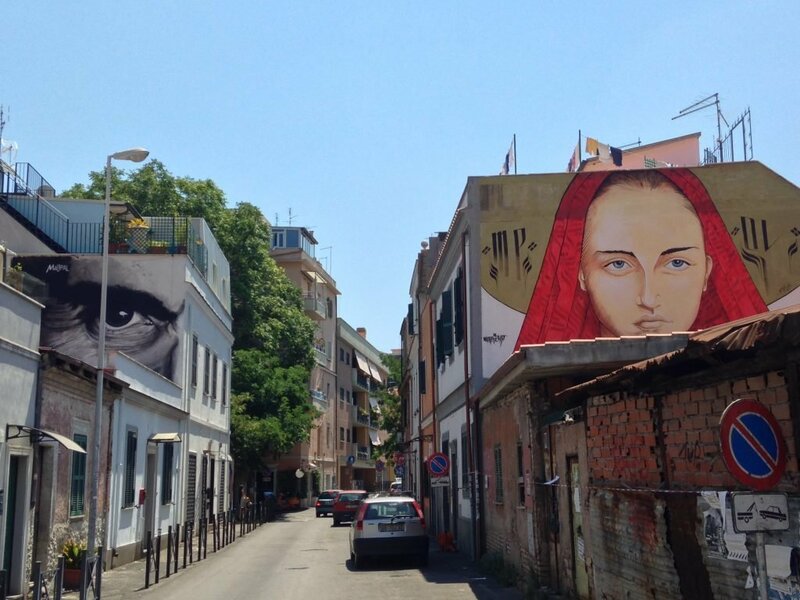 The other good place for spotting street art is in San Lorenzo. You really don’t see it in Rome’s city center.